The Telehealth Counseling Clinic operates in five Brazos Valley counties that are all designated as being mental health provider shortage areas. The program is a collaboration between Texas A&M's College of Education and Human Development and the School of Public Health. The session was offered free of charge by Texas A&M’s Telehealth Counseling Clinic (TCC), a collaboration between the College of Education and Human Development and the School of Public Health that began providing free counseling services to rural Texas residents in 2009. 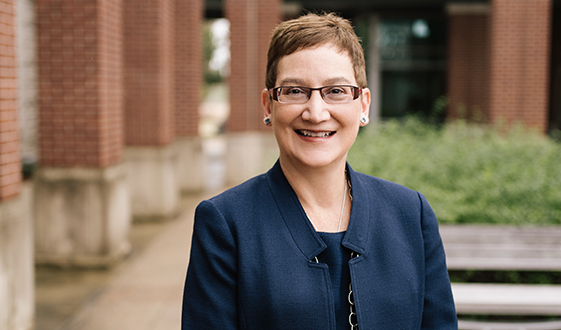 The concept was born after researchers in the School of Public Health discovered that communities across the state were concerned about a lack of mental health care services. Currently, the TCC operates in five Brazos Valley counties, all of which are designated as mental health provider shortage areas: Brazos County, Grimes County, Leon County, Madison County and Washington County. As a Madisonville resident, Webber attended her grief sessions at the Madisonville Health Resources Center, where a licensed psychologist counseled the group through a secure, HIPAA-compliant video connection. In rural places like Madisonville, where the nearest mental health care provider may be hours away, telehealth services are offering a new way to increase access to care. The reality is that more than 80 percent of Texas counties don’t have enough mental health professionals to provide care. This creates a burden that falls to city and county governments, which face increased costs for emergency care and law enforcement assistance. The problem is compounded by the various challenges people experience when mental health issues are untreated. Through its outreach, the TCC hopes to address the mental health care provider disparity facing rural Texas. 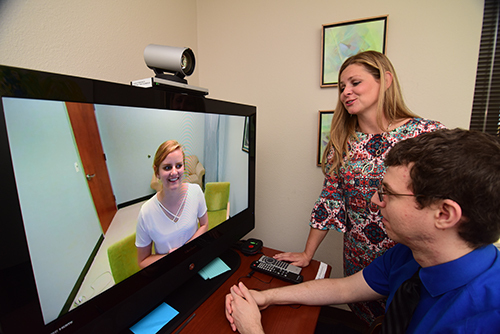 Doctoral students from the College of Education and Human Development’s educational psychology program work out of clinic offices on the Texas A&M campus and provide telepsychology counseling sessions in English, Spanish and Mandarin to clients through secure video connections. While these students are advanced in their clinical training, they work with patients under the supervision of a licensed psychologist. Texas A&M public health students contribute to the cause through research, data management, marketing and outreach. “We call this a hub and spoke model,” said Dr. Carly McCord '13, director of clinical services for the TCC. Clients typically drive to a site near their home, usually a city building with donated, private office space that includes a phone and television monitor with a high-definition videoconference unit. In these safe environments, clients talk with their assigned counselors via video conference call. 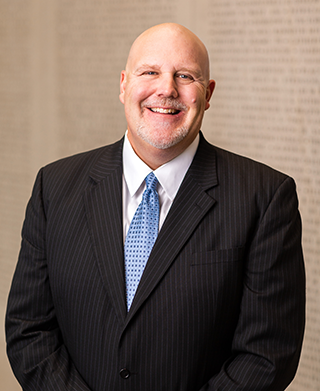 “Every time they come in, we record levels of distress and any recent problems," explained Dr. Timothy Elliott, executive director of the TCC and university distinguished professor in the Department of Educational Psychology. "We also have routine intervals in which we go back and perform assessments on the patient’s mental health and quality of life." Concerns addressed in the counseling sessions include depression, anxiety, bipolar disorder, post-traumatic stress disorder, alcohol and substance abuse, anger management, and grief and family dysfunction. The TCC also offers couples counseling, family counseling, a meditation group and a smoking cessation class. In a typical day, students will review their taped sessions, meet with supervisors and take notes. But they also facilitate extra support for patients, such as calling case workers at the mental health authority to give updates on their clients, requesting welfare checks or consulting physicians about a client's medications. “We’re part social worker, part psychologist,” McCord said. Dr. Carly McCord is the director of clinical services for Texas A&M’s Telehealth Counseling Clinic. Since 2009, the clinic has provided more than 9,000 counseling hours and served more than 900 clients ages 13 and up who may not have otherwise received treatment, as 65 percent of TCC clients are uninsured. More than $1 million in services have been rendered free of charge, while the TCC has also contributed to the education and training of more than 50 doctoral students. The effects of the TCC services are staggering: Individuals have re-entered the workforce, stopped inappropriately using emergency services, repaired broken relationships, improved self-esteem, stayed out of the prison system and gone on to make positive impacts in their communities. County mental health and emergency service budgets are also positively impacted by the provision of this prevention service. You can support the Telehealth Counseling Clinic with a gift of $25 or more online at give.am/TCC. 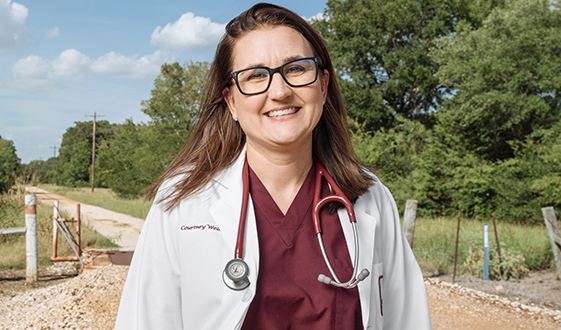 To make an endowed gift of $25,000 or more, payable over a five-year period, that will support the clinic’s efforts in perpetuity, please contact either Jody Ford ’99 (below) with the College of Education and Human Development at (979) 847-8655 or jford@txamfoundation.com or Karen Slater ’88 with the School of Public Health at kslater@txamfoundation.com or (979) 436-9108. 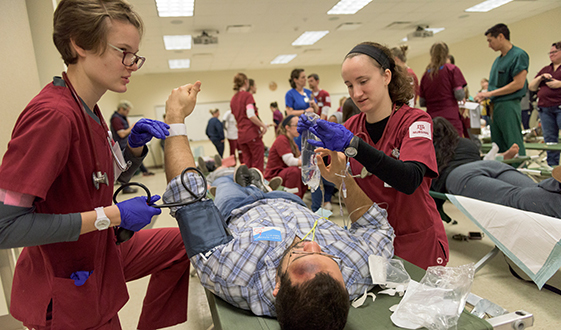 Through mock scenarios, Texas A&M’s Disaster Day prepares students across health professions to practice collaboratively and respond to emergency situations. 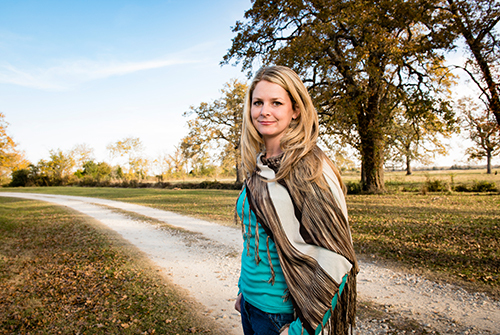 For Courtney Welch '01, becoming a rural physician means fulfilling a family legacy.